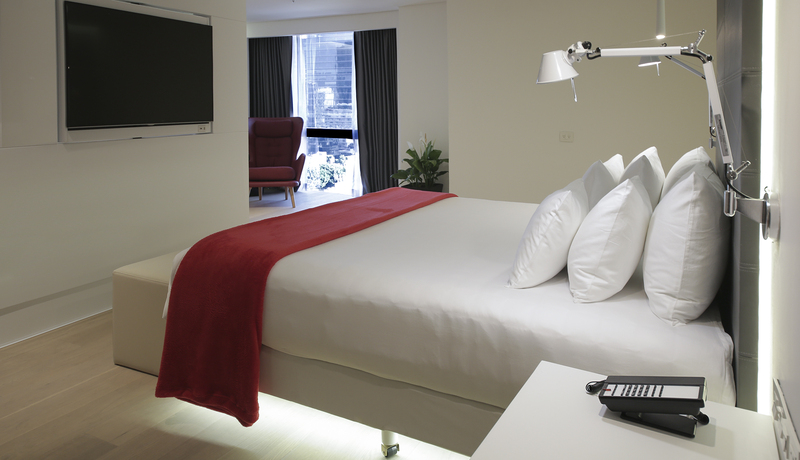 NH Reforma Hotel, Mexico City chooses Teledex E Series micro-footprint hotel phones. Teledex E Series installed at the NH Mexico City Reforma hotel has been featured in the May issue of Equipar Magazine. Equipar, a leading business magazine for Mexico, Colombia, Panama and Venezuela, has featured a full-page article on the NH Mexico City Reforma renovation and Teledex E Series single-line analog corded (E100-8GSK) hotel phones. Originally styled to meet the limited space requirements aboard cruise ship cabins, E Series micro-footprint hotel phones require minimal surface area on the desk and nightstand and are 40% smaller than standard guestroom phones. Engineered specifically for hospitality applications, E Series hotel phones feature patented OneTouch voicemail technology for hands-free auto-dialing and retrieval, up to 12 guest service keys, and customizable faceplates. E Series hotel phones are available in single and two-line, analog, VoIP, corded, and cordless configurations. NH Mexico City Reforma, formerly known as NH Mexico City, sits in the heart of the upscale Zona Rosa neighborhood, just a 2-minute walk from Mexico City's financial district. The tourist attractions in the historic center are only 15 minutes away on the subway and there are high-end shops, bars and restaurants on the doorstep. Our 302 guest rooms are elegantly decorated in a classic style. All of them come with modern comforts such as TVs and free Wi-Fi. The rooms on the upper floors get spectacular views across the financial district's skyline. Equipar promotes project investment in various economic sectors: Hotels, shopping centers, corporations, hospitals, airports, data centers, event grounds, and more. Equipar magazine is bimonthly with a circulation of 15,000 within a high level business sector, including investors, developers, contractors, engineers, architects, and designers. Cetis Sales Teams Collaborate To Meet Hoteliers At HOFEX 2015. 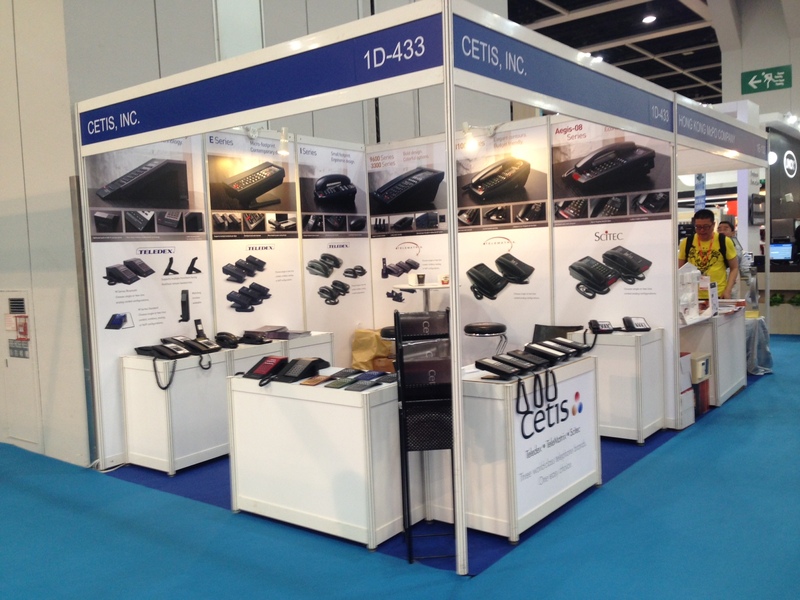 Cetis hotel phones displayed at HOFEX 2015 Booth #1D-433 at the Hong Kong Convention and Exhibition Centre, May 6-9. Sales teams from Cetis China and Cetis Asia-Pacific sales regions arrived in Hong Kong during the week of May 4 to collaborate, organize, and manage Cetis Booth #1D-433 at the HOFEX 2015 show at the Hong Kong Convention and Exhibition Centre. Cetis sales team staff met with customers and prospects attending the HOFEX show, and also organized and completed meetings associated with the show, and throughout the Hong Kong area. Click here to request a visit from a Cetis sales team member in your region, or here to submit a request contact details for a Cetis dealer. We look forward to meeting with you at an upcoming trade show. HOFEX, Asia's leading food and hospitality trade show was held May 6-9, 2015 at the Hong Kong Convention and Exhibition Centre. HOFEX 2015 is the largest show ever in its history with 65,000 m2 exhibiting space, providing a platform for 2,400 international exhibitors to connect with 40,000 regional buyers. Visit the new TeleMatrix website at www.telematrix.net. This month we are featuring our new TeleMatrix website, completely redesigned and expanded to connect you with our our beautifully engineered TeleMatrix 9600 Series, 3300 Series, 3100 Series, Trimline Series, and Retro Series hotel phones. The TeleMatrix website features an eclectic new look, supported by wide frame photography, a full navigation model menu, and colorful, detailed product pages. Visit the Support page to view and download product and support documents, resource tools, product images, news, and videos. Visit the Contact page for details on how to connect for sales and support assistance, or complete one of online forms to request quick responses to your questions, comments, quote requests, or buying inquiries. Click on the social media icons to connect with us on LinkedIn, Facebook, and Twitter. If you have any comments or suggestions regarding the new TeleMatrix website, please write marketing@cetisgroup.com, or visit the Support page and take a minute to answer our short survey on how we can better support your requirements. We look forward to hearing from you! So many choices! Choose Cetis hotel phones for your next new construction, conversion, or renovation project. Which Cetis phone style complements your guest room decor and design preferences? From classic to contemporary, basic to bold, and standard to stylish, only Cetis offers a full range of hotel phones to meet the specific design and feature requirements that you have for your hotel properties. For additional details, visit our Solutions page for an overview of Cetis economy, mid-scale, and luxury telephone options. Visit our Brand Standards page for a guide to preferred or approved Cetis hotel phone models organized by major hotel franchise corporations. So many choices! Choose Cetis hotel phones for your next new construction, conversion, or renovation project. If you prefer to speak with a Cetis sales representative, please click here for the Cetis Concierge and submit your request. We look forward to helping you choose and specify Cetis hotel phones. Social Media Should Be A Hotel's Main Customer Service Platform. Knowledgeable - Both of the hotel's policies as well as the offerings throughout the local area. They need to answer questions about whether any early check-in is possible or the particulars of the pet policy as well as recommend great family-friendly destinations nearby or the best Mexican restaurant within a few miles. Responsive - Establish policies and allocate resources that ensure agents respond within a certain period of time, really as immediate as is possible. The correlation between prompt response times and brand loyalty, or at least a favorable view of a brand, is real and supported by numerous statistics. Cultivate brand loyalists with responsiveness. Empowered - Provide social customer care agents with the ability to "make it right" with customers who have taken to social media to complain as well as access to resources and an escalation system for critical issues or those outside of the scope of what can be realistically resolved online. Advocates - Agents need to be the voice of the customer with the brand and have a vested interest in improving the guest experience while still uploading brand objectives. Authentic - Like all customer service associates, agents should be human and provide personalized compassionate service. Encourage agents to use a signature, or initials on Twitter, and think outside the box to avoid cookie cutter responses. Agents are the "boots on the ground" in bringing a brand's story to life. "The bar has been raised for hotels on social," says DJ Vallauri, Founder and President of Lodging Interactive. "Between the call for consistent, fresh content and the increase in questions, on-site issues and experiences shared on channels like Facebook and Twitter, it's no longer just a place for a hotel's marketing department to just push out content." Click here to read the entire article at Hotel-Online. Value Of The Guest Room Phone. Don’t forget that your traveling guests still need to get in touch with business colleagues or loved ones in other countries, and their cell phone may not be globally-capable, or configured through their cellular carrier with an international calling plan — or perhaps they prefer to utilize the hotel guest room telephone on the company's dime. 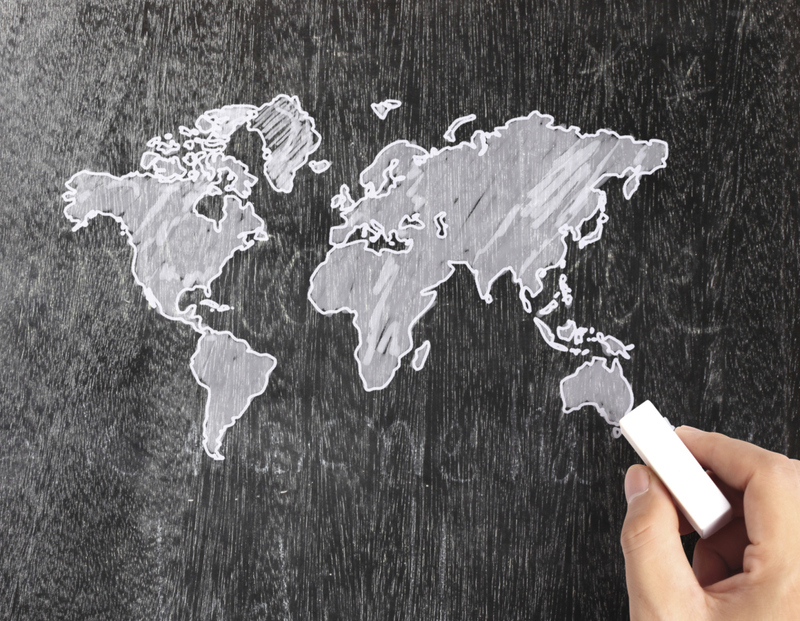 What are international calls worth to hoteliers? Recent research shows that revenue from international calls at one full service 500-room hotel with an 80 percent occupancy rate is worth from $15,000 to $20,000 per month. Do the math! This works out to $180,000 to $240,000 a year in international call revenues generated by the in room telephone. Upscale Teledex is the preferred Cetis brand hotel phones for our Four-Star and Five-Star hotel partners. MidScale MidScale hotel franchise corporations specify competitively priced TeleMatrix brand hotel phones by Cetis. Economy Value never looked so good to our loyal Scitec economy hotel partners. Click here to ask a question or let us know how we can assist you with your hotel renovation or new construction project. Store your valuables in the safe provided in most hotel rooms, or ask the front desk if they can store them for you. It’s always a good idea to protect your jewelry, important travel or event tickets, passports, and extra cash. Keep them safe!